Discussion in '2020 Recruiting Profiles' started by Jared Grubbs, May 3, 2018. Butler has shown interest in Jaden Ivy and Tayson Parker on the Spiece Indy Heat 16U team (2020). I will watch them tomorrow. 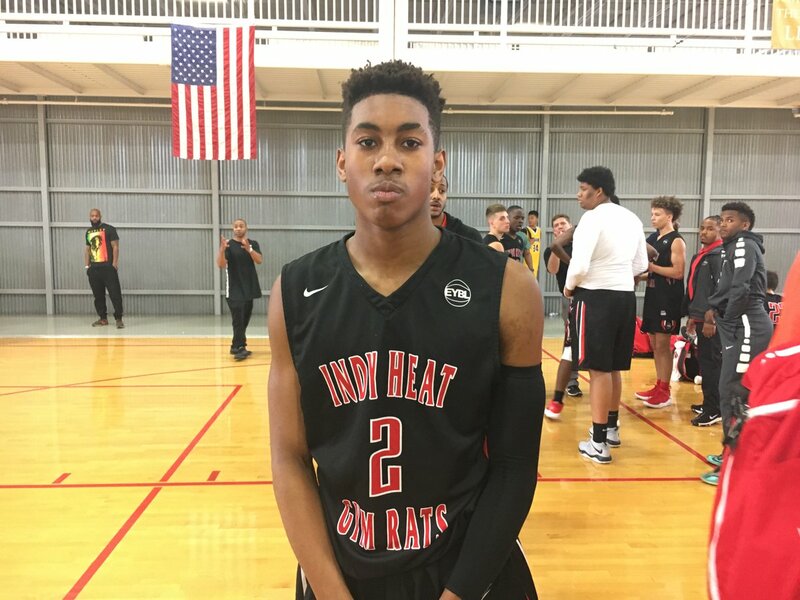 Jaden Ivey off to a strong start for Indy Heat 2020. He’s buried 2 3s and drove and finished a scoop layup around a help defender. I don’t see much info on him online but he’s impressive 7 minutes in. Now he just drove to the lane and kicked for an open 3. He’s listed as a 6’3” SG but he is showcasing some PG skills too. Ivey was one of my favorite players yesterday. He continues to impress on another court today. I’m watching Indy Heat 2020 bs C2K Elite. We’ve got Jaden Ivey guarding Zeb Jackson here. Slow shooting start for everyone except 2022 guard Kamari Lands, who has sunk 2 3s. Joey Holifield with a great first half for C2K. He had a strong drive and spin move for a layup just a minute ago. That was his 3rd bucket off the dribble. Jackson is playing terrific defense on Ivey, but Ivey still made a ridiculous drive and circus layup not too long ago. It was a 5 Star quality play displaying quickness off the dribble, body control, and ability to finish a difficult angle shot at the rim. I think it’s his only bucket so far. Until now, he just banked in a pull up 3. Garrott Ott-Large is knocking down tough shots again. He’s from LaPorte. Looks like a high level shooter who has the strength to do other things as well. Zeb Jackson is doing a terrific job of getting solid looks for both himself and teammates. He just slices into the lane anytime he wants. Right now he is shooting poorly though. I think I like him a little better than Ivey based on this game alone, but it’s tough. Jackson appears to be the better defender. He slides his feet better and is more willing to fight through screens. I still really, really like Ivey though. Jackson just buried a 3 and then blew by his man and finished over the top of 2 help defenders as I was typing that. Ivey buried a 3 and picked up an assist on a laser sharp pass. Jackson blow by to the rim again. Wow this is a fun game. Ivey got by Jackson now and picked up another assist. Indy Heat won. I’m still up in air of which of those 2 players I like better. I’d be happy if Butler went after either aggressively. Both are lengthy PGs that can do about everything. They can play on or off the ball. The term combo guard is grossly overused but both of these guys are combo guard which I love. I’ll definitely have threads up for both of them tonight or sometime soon as I absolutely want to track them more and Butler has interest in both. I just copied over a bunch of posts from my personal observations at Run N Slam related to Ivey. I swear I posted this info but I can't seem to find to find it: an Indy Heat coach told me that Butler has shown interest in Ivey (as well as Tayson Parker). It's not much to judge interest but that combined with his spectacular play is enough that I want to get his thread up. He's absolutely going to be worth monitoring. High major player. Butler called him today. First day coaches can contact 2020 recruits. Sounds like he had an good weekend this past weekend against some local high schools. His mom is an assistant at ND for the women’s team and he has another connection to OSU (uncle?) so look for those two to be strong here. Quote from an article on 247 “We’ve heard from a lot of mid-majors — Butler, Miami Ohio, IUPUI, Ball State.” Thats from Iveys mom. To be fair, when Niele Ivey went to school (97-01), Butler still was a mid-major. She also graduated with a degree in history, so that means she isn't interested in current events. This also perpetuates the perception that inside the state, Butler isn't as well thought of as a basketball school as it is outside the state. Makes sense why so few kids on the team are from Indiana anymore. Offered. I’m very happy about this offer. His potential is as high as anyone. jkcdawgs and BHayden like this. Want. He was the most impressive player at the Run-N-Slam this spring IMO. Wish we would've offered a couple months ago, but hopefully LaVall can go win this one. Looks like Purdue's his only other offer. Good offer to add to the guard list for 2020. FriarDawg and seadawg like this.